We have all laughed at ‘Dad’s Army’, but behind the mishaps and jokes was a very serious purpose. 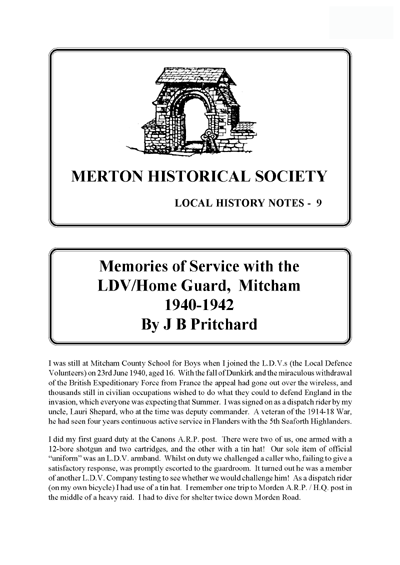 These notes give a clear, factual account of the formation, arming and training of the Mitcham Home Guard, formed to protect Mitcham against the threatened German invasion or any other hazard. A timely reminder of desperate measures needed in desperate times. and shot a hole through the ceiling! Most nights were spent at the Coy. H.Q. at the Golf House. If the weather was bad patrols were cancelled, and we played darts instead! their black overalls and beret. I was posted for a week’s attachment to the 1st Battalion Welsh Guards on Wimbledon Common. of it! In retrospect, it must have been comical to watch – somewhat like a comedy stage sketch. However, I learnt a lot by joining in all parades and patrols and talking to them all. to the rank of lance-corporal. I joined the Royal Tank Regiment, and landed with the 7th R.T.R. he had seen four years continuous active service in Flanders with the 5th Seaforth Highlanders. the middle of a heavy raid. I had to dive for shelter twice down Morden Road. all had rifles, ammunition and tin hats, and within a short time our title was changed from L.D.V. drill, once the bayonets arrived) and exercises over the Common. devices suspended on parachutes – dropped on it, two of them being the first to fall in England. all right, but the next day the body of a third person was found. him that as a member of the Home Guard I would not be able to do Fire Watch duty at the bank! p.m., so we opened when we should have been shutting. and were later told the “parachutists” were puffs of A.A. fire drifting across the moon! On other occasions it was reported a light had been seen on the Common signalling to the bombers. would not be allowed in the guardroom because of the smell! unveiled at the Creameries in 1962.
undoubtedly have caused some casualties. many people, who thought the invasion had started. This entry was posted in Publications, Local History Notes and tagged in lhn, mitcham, modern mitcham, Reminiscences, wartime.